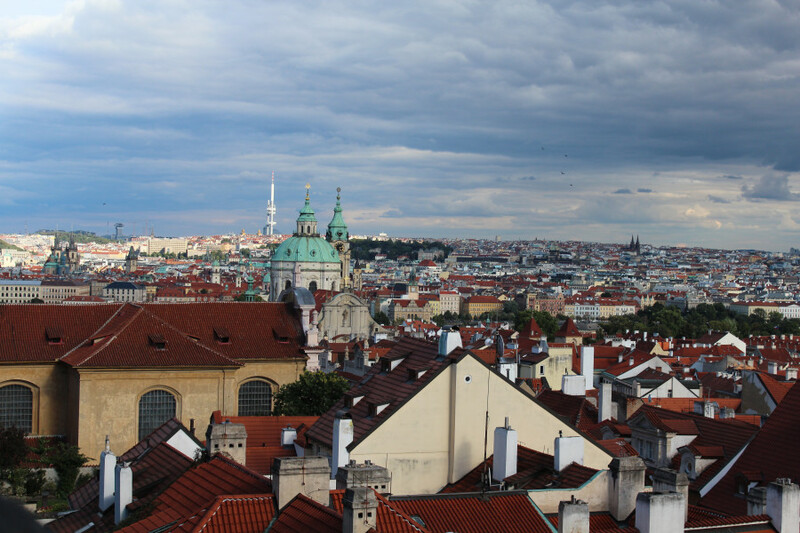 In the past few years, Prague has become a top destination for city travellers. No wonder - the Golden City has a lot to offer. From historic buildings to modern architecture, from museums to souvenir shops and a varied culinary scene, you will find everything your travel heart desires. And in one respect, the Czech capital is clearly ahead of megacities like London or New York: it can easily be explored on foot. Join us on a walk along Prague's most important sights! © Tourispo / M.Lang The statue of Jan Hus is located at the centre of Old Town Square. Our tour starts at Old Town Square, Prague's central market square. Coming here is an experience for all the senses: watch street performers and pantomimes; listen to the sounds of street musicians; enjoy the delicious smell of fresh trdelník (typical Czech baked good), and maybe even treat yourself to one. This square is the centre of the Old Town, and has more than just one sight in store. The characteristic towers of the Church of Our Lady before Týn rise up in the west. Right next to it you can find an art gallery exhibiting, among others, famous works of Dalí, next door to the National Gallery. 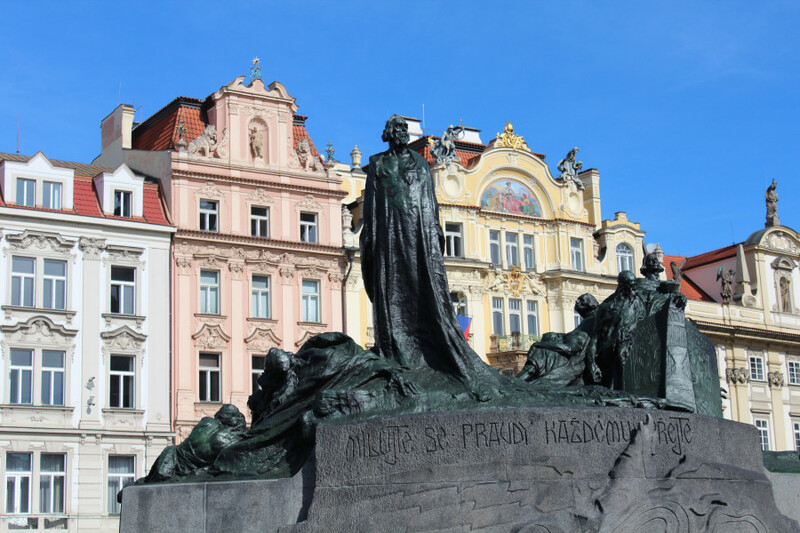 At the centre of the square, the large Jan Hus statue honours the theologian who was burned at the stake for his reformatory ideas in 1415. 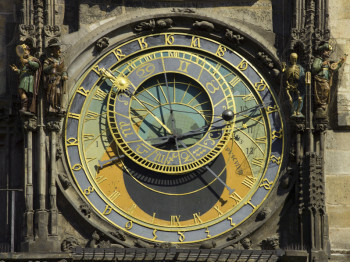 A few steps further you find the most famous attraction: the Astronomical Townhall Clock. When it was built in 1410, it was the only one of its kind. To this day, it is surrounded by legends. © Tourispo / M.Lang View of Charles Bridge from Kampa island. After having watched the clock's famous chime play at the top of the hour, we move on around the corner and into Karlova street. Passing various shops and restaurants, the ever tightening lane finally leads us to the Old Town Bridge Tower. 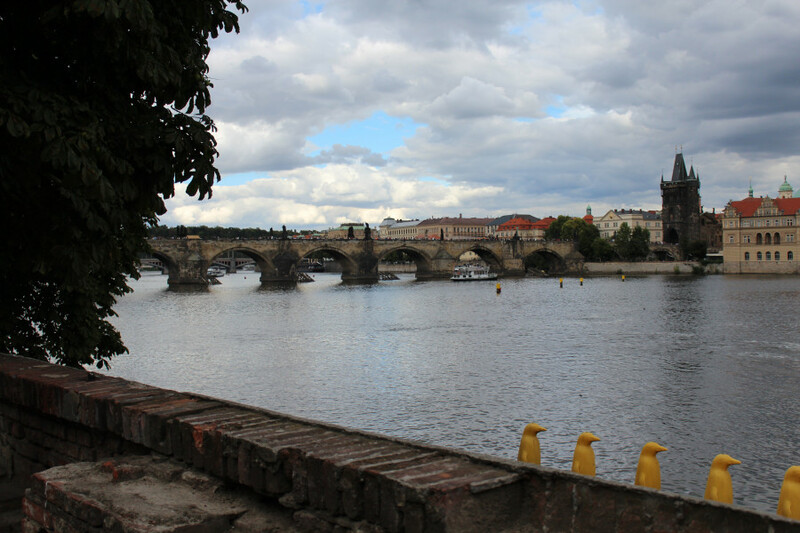 For about €4, you get a great view of where we go to next: Charles Bridge. © Tourispo / M.Lang John Lennon Wall: "Láska" is the Czech word for love. Just before Charles Bridge ends on Malá Strana, we take the stairs on the left-hand side and find ourselves on Kampa island. After only a few steps, you enter a peaceful park, contrasting pleasantly with the hustle and bustle of Charles Bridge. Furthermore, it is the perfect place to take a nice picture of the famous bridge. On our way back we pass Hrznová street on the left, and cross the little bridge to Velkopřevorské náměstí. 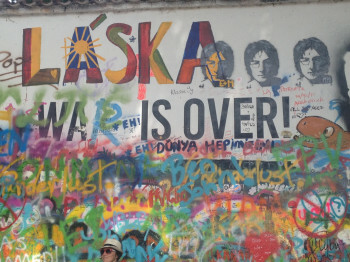 After his death, graffiti artists turned the wall here into a memorial to John Lennon. There is usually a street musician around, providing the proper Beatles and Lennon tunes. We return to Chares Bridge, this time taking the stairs on the other side. After a few steps we turn into U Lužického semináře street. Our next stop is the Kafka Museum. You know you're in the right place when you see the fountain with David Černý's "Piss" statue. Tickets can be purchased at the museum shop across the street. 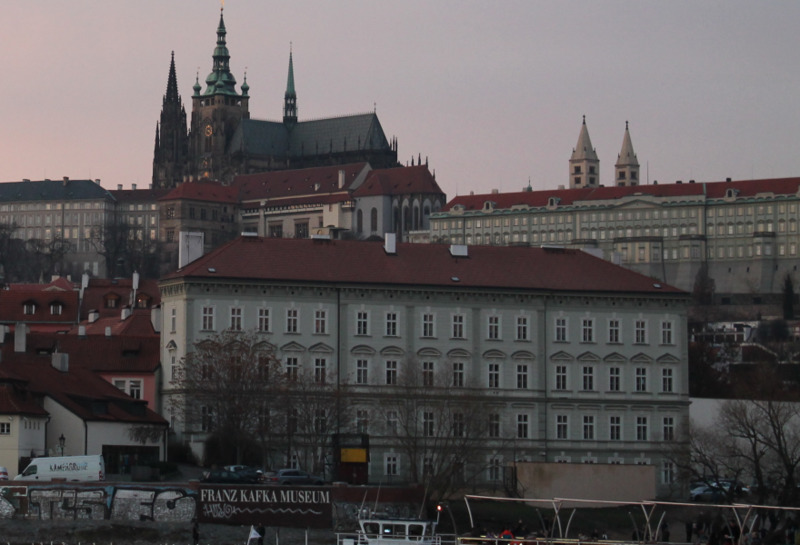 The museum illustrates impressively the close ties between Franz Kafka and the city of Prague. The two-part exhibition includes first editions, manuscripts, letters, drawings, and photographs. The exhibits are presented in a gloomy atmosphere, supported by 3D and audiovisual installations as well as its proper soundtrack. © Tourispo / M.Lang Prague Castle is one of the city's landmarks. Next on our route is Prague Castle. We go back to U Lužického semináře and turn right into Mostecká. Passing the Church of St. Nicholas, we turn right and then left, and are now following Nerudova street. If your stomach has started growling in the meantime, you will find a variety of restaurants here, ranging from typical Czech to Italian or vegetarian cuisine. Continue straight until the road veers to the right and up towards the castle. The uphill effort is rewarded with an amazing view over the Czech capital. We find ourselves at Prague Castle's forecourt, where we enter Europe's largest enclosed castle complex. You can just walk around the accessible bits and enjoy the view. If you want to see more, there is a range of visitor circuits that get you inside some of the historical buildings, such as the characteristic St. Vitus Cathedral. Golden Lane, a lane filled with small colourful houses hosting shops and exhibitions, can only be visited in the course of such a tour as well. 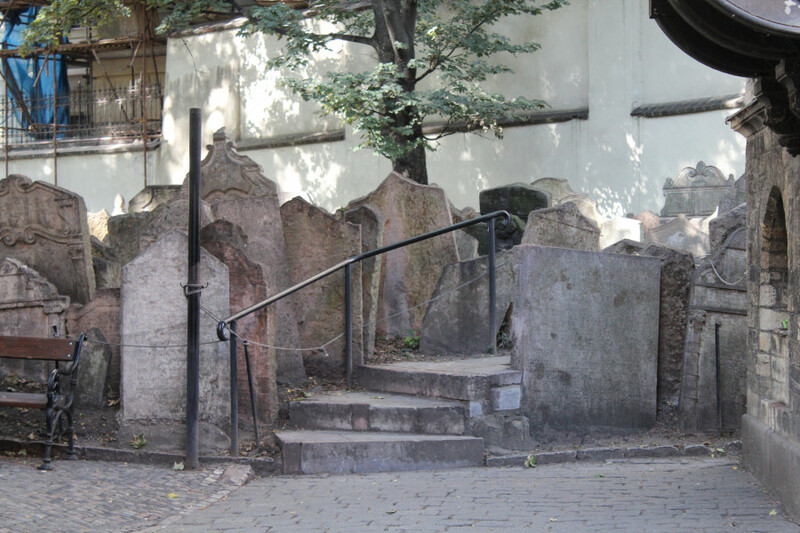 © Tourispo / M.Lang Over 12,000 gravestones can be found at the Old Jewish Cemetery. On the other side of the castle complex we find the Old Castle Stairs, going all the way back down. The historic stairs lead us to Pod Bruskou street, which we follow until Mánesův most on the left takes us back to the other side of Moldova river. Our last destination is Josefov, the old Jewish Quarter. We keep left and get to Široká, leading straight to the Jewish Museum. A ticket to the museum not only includes entry to the exhibitions and several synagogues. It also grants access to the Old Jewish Cemetery. It is one of Europe's most famous and historically relevant Jewish cemeteries. Its countless, closely spaced, crooked tombstones are particularly striking. Under the bumpy surface at its feet lie up to 12 layers of graves. The most famous one is that of Judah Loew, who is said to have created the legendary Golem. 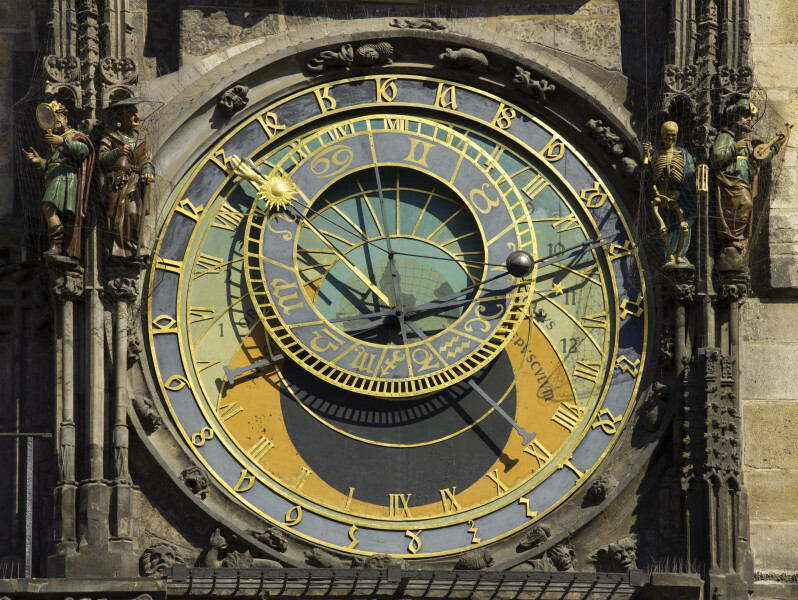 CC BY-SA 3.0 Godot13 - Eigenes Werk The famous Astronomical Clock on the tower of Prague's town hall. From the cemetery, Maiselova street leads us past Kafka house and St. Nicholas church back to where we started: Old Town Square. This is the perfect place to end the day. The lanes behind Týn Church are full of pubs and restaurants to enjoy a few drinks as well as Czech or international cuisine.